WILMINGTON -- The city of Wilmington is getting a massive new sports complex. 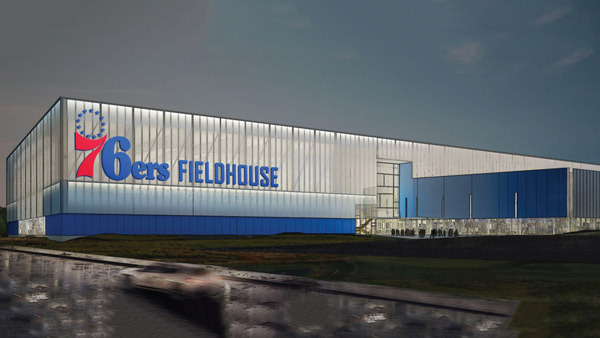 The new facility will be known as the 76ers Fieldhouse. Crews are planning to build the 140,000-square-foot, multi-purpose sports complex and youth training center on an 8.9-acre parcel of land off U.S. Route 13 and Garasches Lane. It is expected to open at the end of 2018. The 76ers' NBA G League affiliate Delaware 87ers, who will be rebranded next season, pending league approval, will play their home games at this new facility. The Fieldhouse is configured to host approximately 2,500 fans per game. It will have three full-size professional basketball courts, two indoor turf soccer fields, a world-class sports performance and athletic training area, as well as retail and office space.